Are you unable to wear your pretty sandals in the summer because your feet look so ugly? Have your feet become dry and chapped or have your heels cracked, even during the winter months? These situations are usually due to a buildup of dead skin on the feet. Hard calluses or a rough layer of skin are the result of accumulated dead skin cells on certain parts of your body, especially your hands and feet. 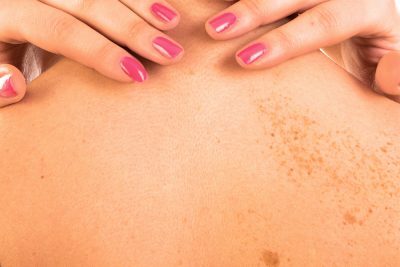 While dead skin is not pleasing to the eye during the summer months, in winter the excess layer of dead skin is often prone to dryness and chapping. The skin on your feet is naturally dry, as the feet have no oil glands. Consequently, you need to keep them well-moisturized in order for the skin to stay soft and healthy. Standing on your feet for long periods of time, which applies extra pressure on your feet. Using strong soaps that are harsh on the skin. Being overweight, in which case your feet have to bear a heavier load. Not wearing the right footwear. For women, wearing high heels can lead to the accumulation of dead skin. Therefore, it is important to start taking care of your feet. Here are six simple remedies or treatments that you can do at home to remove dead skin from your feet. Soaking your feet in water is not just a great way to relax after a long, hard day at work, it also helps loosen up the dead skin on your feet so you can scrub it off and reveal clean and healthy skin. It’s best to use this method at night before going to bed. Fill a small tub with warm water and add some liquid body soap. Soak your feet in it for about 20 minutes. Use a pumice stone to gently scrub off all the softened dead skin. Take special care to thoroughly remove all the dead skin on and around your heels, as they bear the most damage in the course of everyday life. 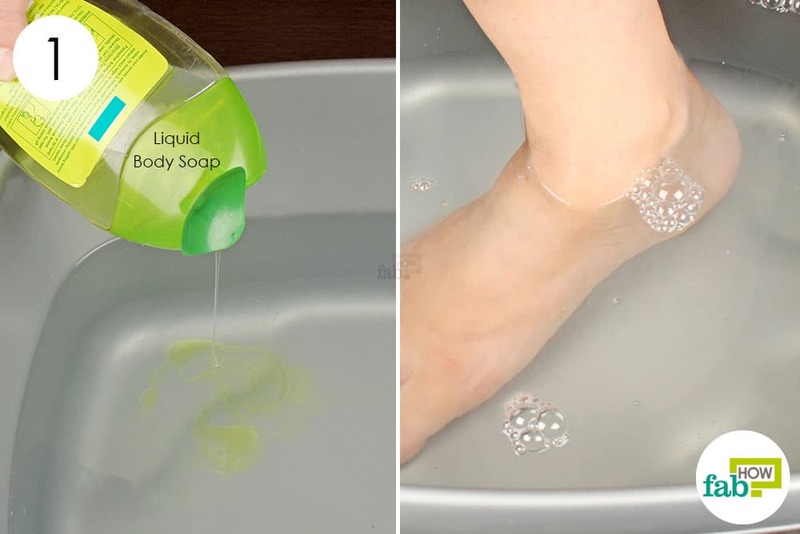 Rinse all the dirt and dead skin cells off your feet by pouring some cool water over them. 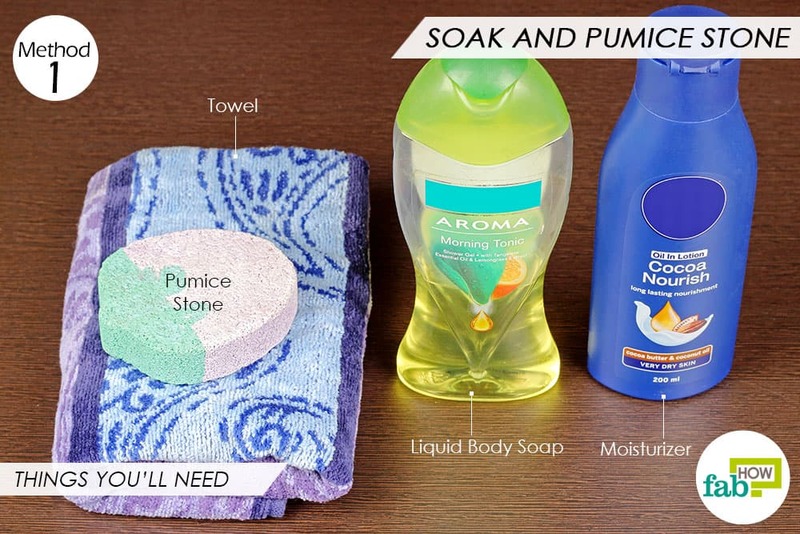 Wipe and dry your skin thoroughly using a soft towel. Massage some moisturizer or foot cream into your feet to keep the skin soft. Do this at night and wear cotton socks to bed in order to lock in the moisture. Do this daily for at least 1 week to remove dead skin from your feet. Then, continue the soaking-scrubbing ritual once a week to maintain beautiful feet. 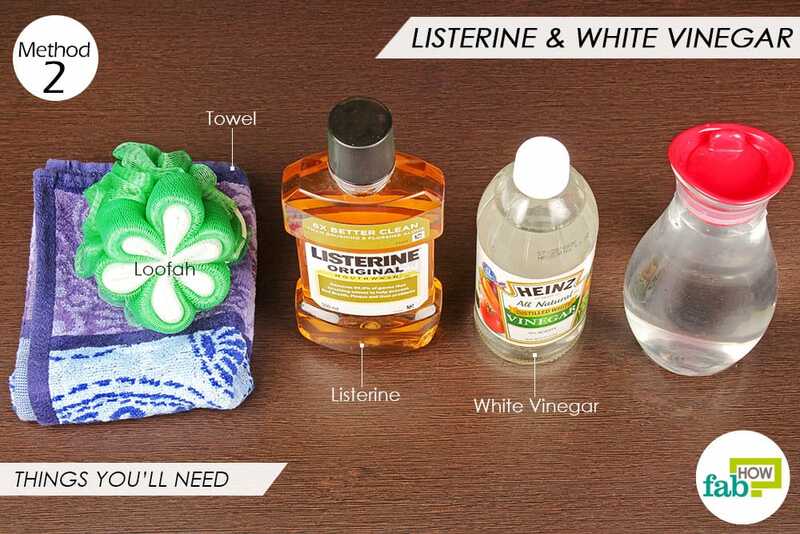 Vinegar and Listerine both have strong exfoliating properties that can help you get rid of the rough layers of dead skin on your feet. A warm water foot soak with vinegar and Listerine will help soften your calluses and loosen the dead skin so you can scrub it off. It’s best to perform this treatment at night before going to sleep. Take 2 cups of warm water in a small foot tub. 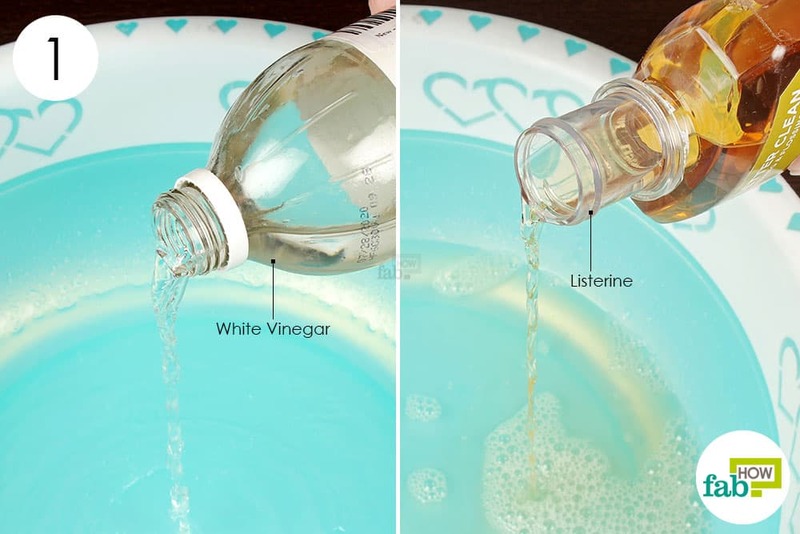 Add ¼ cup each of white vinegar and Listerine. Stir once to mix all the ingredients. Soak your feet in the warm bath for 30 to 60 minutes. You can add more warm or hot water after 30 minutes. After 20 to 30 minutes, use a loofah to gently exfoliate your feet, especially your heels. Rinse your feet with cool water. Do this every alternate day for at least 1 to 2 weeks to get rid of dead skin on feet. Epsom salt soaks are extremely relaxing and a wonderful treat for your much-abused feet. This salt contains some wonderful minerals, among them magnesium that improves blood circulation in your feet and also draws out toxins. 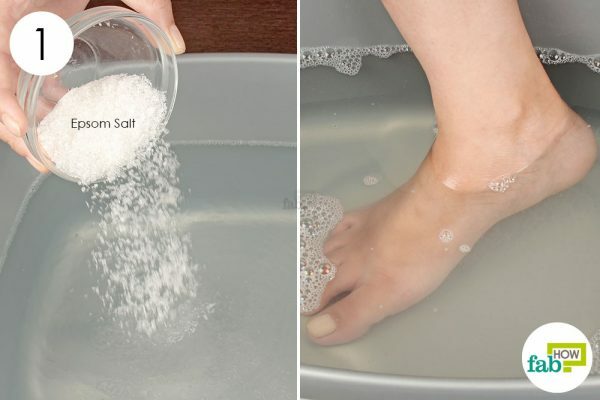 A good, long foot bath with Epsom salt can soften up your calluses and the rough layer of dead skin. Applying the aspirin-lemon paste will further help soften the hardened skin layers. Like other methods, this finishes with applying moisturizer on your feet. It’s best to do this treatment before going to sleep to let the moisturizer work overnight. Fill the small tub with warm water. Add 1 cup of Epsom salt and stir until the salt is completely dissolved. Soak your feet in it for 30 to 40 minutes. Put 7 to 10 aspirin tablets in a bowl. Squeeze the juice of ½ lemon into the bowl. Stir until the tablets have completely dissolved and you have a smooth paste. 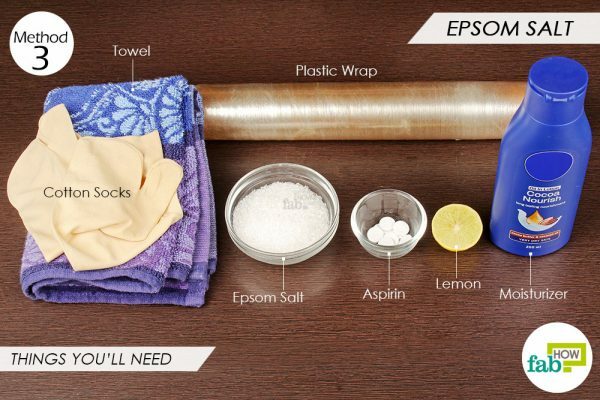 Rub the aspirin-lemon paste on the rougher patches of skin on your feet. In order to let the aspirin loosen up the dead skin, wrap your feet with plastic wrap to seal in the paste. Keep the wrap on for 4 to 5 hours. Remove the plastic wrap and wash your feet with cool water. Apply a thick layer of moisturizer to further soften and moisturize your skin. Go to bed with cotton socks on your feet to seal in the moisture. Do this every day for 1 week to completely remove dead skin from your feet. Another effective way to remove dead skin from your feet is to use a DIY scrub. Lemon works to soften and loosen up the rough dead skin, while olive oil and honey nourish the skin to keep it moist and healthy. Brown sugar is used in many exfoliating DIY skin scrubs. As you massage the scrub on your feet, the brown sugar gently exfoliates or scrubs off the softened dead skin. 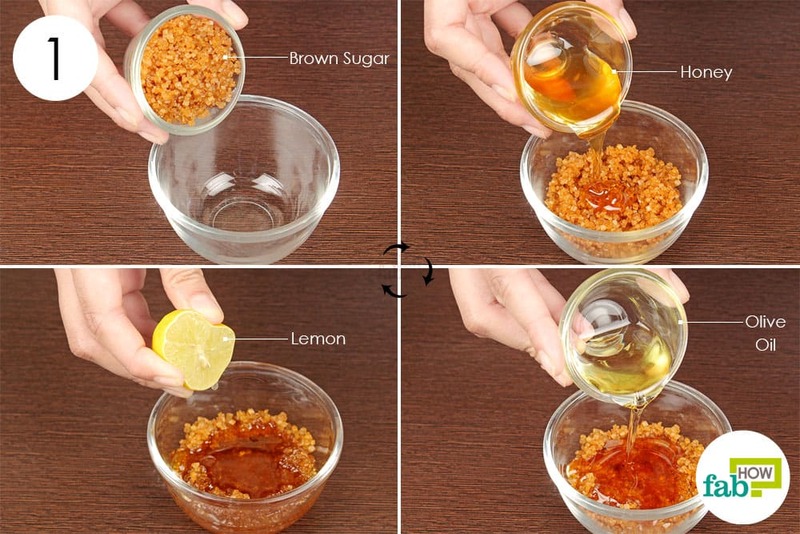 Put 2 tablespoons of brown sugar in a small bowl. 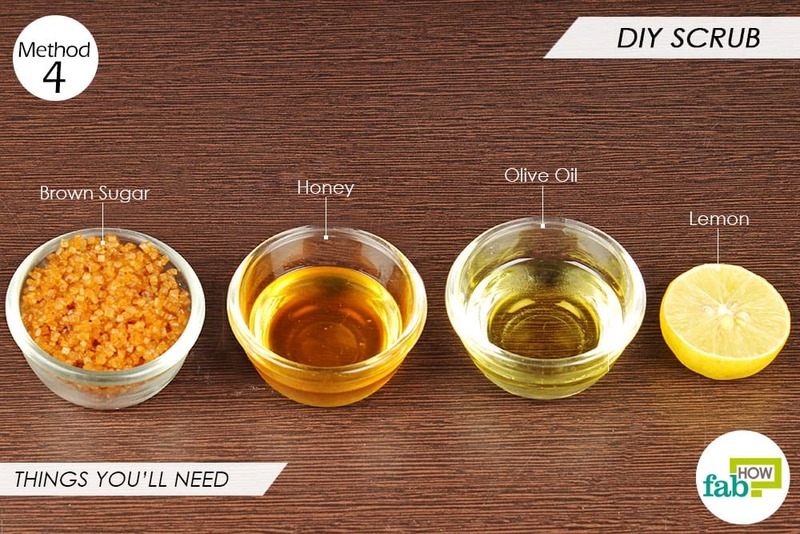 Add 1 tablespoon each of honey and olive oil. 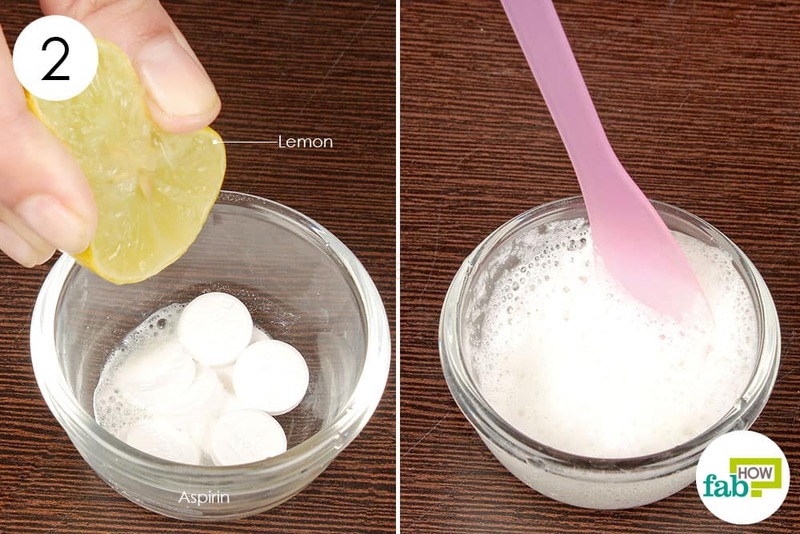 Squeeze the juice from ½ lemon into the bowl. Soak your feet in lukewarm water for about 20 minutes and wash them thoroughly to remove all dirt and impurities. Rub the prepared scrub all over your feet using circular motions to remove all the dead skin. Wash your feet with cool water to reveal smooth and glowing skin. Use this scrub 2 to 3 times a week for proper exfoliation. Dead Sea salt contains several minerals that are beneficial for your skin. Additionally, it gently exfoliates hardened and rough skin, and helps it retain moisture. 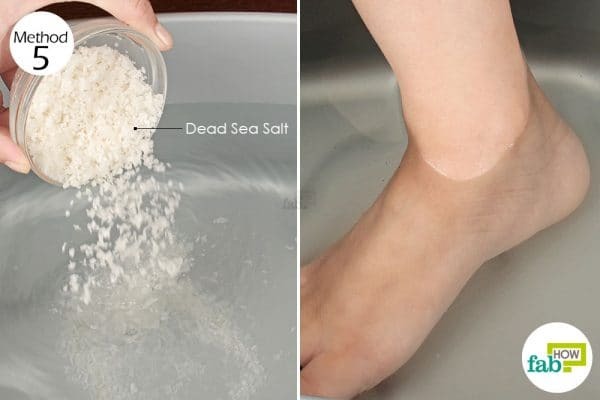 This makes this special variety of salt from the Dead Sea a wondrous and easy remedy to remove dead skin from your feet. Fill your foot bath with warm or hot water, depending on your preference. Add 1 cup of Dead Sea salt and stir until the salt dissolves completely. Do this once every week for gorgeous feet that you can proudly show off. 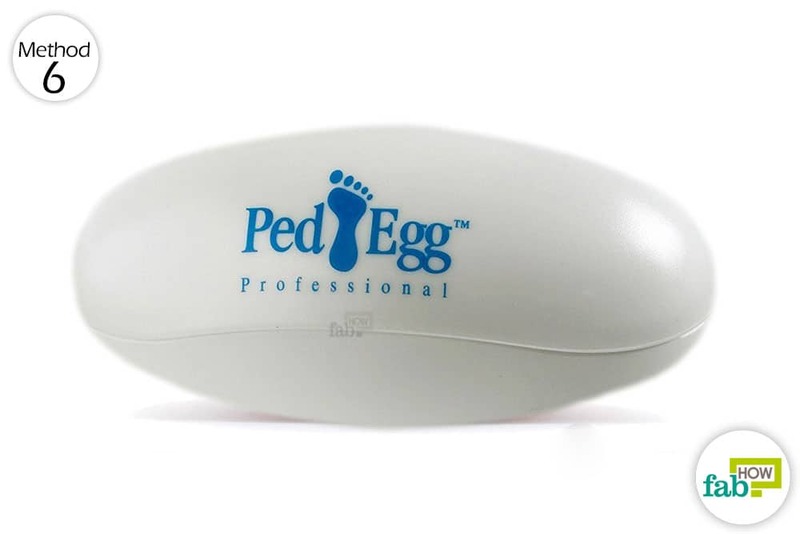 Ped Egg is a commercially available foot file, which is shaped like an egg and is extremely useful for manually scraping dry, dead skin and calluses off your feet. The egg-shaped device actually breaks into 2 halves. The file surface resembles your average cheese grater with scalloped holes. Gently remove dead skin from your feet by scrubbing them off with the file. Beneath the file surface, there is a hollow interior that collects the dead skin when the file is being used. The lower portion of the egg-shaped device contains an emery pad or a sandpaper surface. After you have filed away the dead skin, gently rub this on your feet to give your skin a smoother look and touch. Use this wonderful device at least once a week for beautiful feet. To maintain soft skin on your feet, use a pumice stone to gently exfoliate your feet every time you bathe. Apply a good foot cream regularly. Wash your feet, then massage in the cream. Do this every night to prevent the buildup of dead skin cells. Get a DIY pedicure kit and use it once a week to maintain healthy skin on your feet. Avoid standing on your feet for long hours. Get shoes or sandals with doctor soles or padded soles to relieve the pressure on your feet.